Pixy is a fast vision sensor for DIY robotics and similar applications. You can teach Pixy an object just by pressing a button. Use Pixy for lots of different applications! It’s capable of tracking hundreds of objects simultaneously and only provides the data you are interested in. No need to futz around with tiny wires – Pixy comes with a cable to plug in to Arduino, so you can quickly get started. 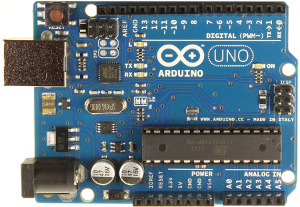 No Arduino? No problem! Pixy has a multitude of ways to talk to other devices. To get you up and running as fast as possible, we offer free software libraries for Arduino, Raspberry Pi and BeagleBone Black. Pixy also makes your life easier by only sending the data you’re looking for. For example, if you teach Pixy a purple object, you will only receive data (X-Y coordinates, size, and unique ID) about purple objects. Pixy is a collaboration between Charmed Labs and Carnegie Mellon University.